With regard to evidence of early earth-sheltered homes, evidence is of course sparse (over longer periods of time such buildings obviously don’t leave much in the way of remains unless a lot of stone is used). The oldest such buildings that are still recognizable include prehistoric earth lodges in North America measuring more than 90-feet in diameter, and the famous Neolithic Skara Brae site in the Orkney Islands (occupied from around 3180 BC until 2500 BC or so — that is, before the Celtic cultures moved into Europe from Anatolia during the late-Bronze Age civilizational collapse). More recent examples abound throughout North America and Europe though — owing to the climate, for instance, many earth-sheltered houses in Iceland that are several hundred years old are still around. Rather than spend too much more time discussing the history of earth-sheltered houses, though, what this article sets out to do is to provide an overview of the approach to building, and things to consider when designing and planning for the creation of such homes. In addition, possible problems and disadvantages will be discussed, plus a bit more information on the history of such homes. With regard to modern earth-sheltered home design plans and considerations, there are quite a lot of options out there right now, but you could conceivably divide them into 3 primary categories: subterranean, earth-covered, and earth-bunded. 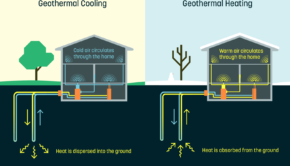 To use different words here, your primary options are: a house that’s completely (or near so) underground; a house where the roof and/or possibly one or more sides of the building are in contact or covered with soil or substrate acting as an insulator; or a house that’s effectively covered to a significant degree by soil or substrate (an earth-bunded home). While those are your theoretical options, your effective options will be limited to what you can get built and/or approved, and by the expertise available in your region (as the building modality is rare in the US and in many other places, it may be hard to find people or companies that have experience with it). To elaborate on the above further — the primary building methods for earth-sheltered homes are: excavation (digging a home out of the ground or a cliff/hill); and/or earth-berming (piling soil or substrate up against exterior walls that are above ground, or mostly so, and packing it to create an artificial slope to redirect rain). It’s notable here that one of the primary stumbling blocks to the effective design of underground or hill-excavated, earth-sheltered homes — possible moisture problems — can be fairly easily avoided through the primary use of earth-berming and mostly above-ground contraction. When designing earth-sheltered homes with limited exposure to open air and light it’s important that considerations are made to maximize their function — e.g. if the house is set into a hill in a cold climate then it’s very much worth it to site it so as to maximize southern exposure (presuming you are in the Northern Hemisphere); or if you are doing an underground home to make sure that there is a large enough courtyard opening, or enough ventilation/light holes so as to make the place livable and comfortable. With regard to the most common approach to construction, earth-berming — this is a building practice wherein structural components (in the modern world, usually steel-reinforced concrete) are surrounded by soil or substrate of some kind, effectively enclosing the building in an artificial hill which functions as very effective insulation. Traditionally earth-berming was usually accomplished by piling sod or peat around and on top of a stone or timber constructed building — colonization of this earthen material then followed over the coming months and years leading to the appearance of a house enclosed in a hill. While you may be thinking right now of so-called “hobbit homes,” the fact is that such construction methods can meet the requirements of pretty much any client — Bill Gates, for instance, had an earth-sheltered home built for him on the edge of Lake Washington that is by all accounts a massive complex, but which doesn’t appear all that extravagant from the outside because the design (photo above). Now that a basic overview has been provided, it’s time to go into the details. The primary benefits of earth-sheltered homes are: the highly stabilized climates within them (due to insulation and high thermal mass); the relatively low maintenance requirements; the great protection from winds and storms (obviously flood waters can remain a problem in some regions, so the need is there to account for this during design); resistance to damage from wildfires or freezing pipes; and an inconspicuous design allowing for greater privacy (hence the reference to Bill Gates’ compound earlier). To elaborate on the high thermal mass angle — because of the amount of mass involved, and the ability to aboard and radiate heat, earth-sheltered homes possess internal temperatures which are much more stable than those of conventional homes. As a result, earth-sheltered homes have long been in use in colder climates and still have much that can be said for them in such circumstances. The ground itself, for that matter, generally maintains a very stable and relatively high temperature, so if you build down into it in many regions, that is enough on its own to stabilize internal temperatures somewhat. Also noteworthy is the effect of limiting air infiltration from outside, which works to reduce heat loss during winter and cold loss during summer. As the result of all of this, heating and cooling costs for earth-sheltered buildings can often be drastically lower than for conventional homes — especially when combined with passive solar design meant to maximize heat gain during winter and minimize it during summer. A further benefit is the greatly improved soundproofing of such buildings — indeed earth-sheltered homes can be remarkably quiet within, even when situated in relatively noisy areas. There are a number of problems that can arise with poorly designed earth-sheltered homes, and they are all fairly intuitive — owing to a possible lack of air exchange, for instance, moisture buildup and mold can be a potential problem. Others include: condensation; water intrusion (seepage); radon; a lack of natural light; and strange acoustics. Thankfully, though, these problems can more or less all be avoided through intelligent design and siting, and by taking the particulars of the region and location that you are building at into consideration, and then taking necessary actions. Potential problems with condensation and seepage are mostly due to possible failures of waterproofing layers or membranes — most often due to poor construction and/or bad design. All the more reason to make sure that your builders are experienced in such work before signing on the dotted line. If you’re building your house yourself, then of course avoiding these problems is more a matter of keeping design relatively simple, designing with a large margin of error (for resilience), and being thorough. Potential humidity and condensation problems can also be avoided to some degree through the use of geothermal heat pumps. The idea is to design a system to draw fresh air into the house from the outside through the chimney effect, thus limiting indoor air stagnation and humidity buildup. Obviously something to keep in mind is that design consideration and needs vary a great deal based on the climate and topography in question — what’s needed in a humid tropical environ is quite different from what’s needed in a desert, and the needs in a mountainous region are different than in flatlands; etc. Other primary considerations to take into account include: soil/substrate type; associated and nearby vegetation and trees; the depth of the frost-zone in your region; water table information for the site in question; building and insulation material preferences; local insect types and prevalence (which can possibly damage some foundations and/or waterproofing); and possible use of passive solar + energy efficiency design elements. Those wanting a closer look at modern-style earth-sheltered housing designs may want to take a look at the Swiss architect Peter Vetsch’s work — which makes substantial use of sprayed concrete methods, and curved walls, amongst other things. Vetsch has to date designed and built several dozen earth-sheltered houses using such methods, and as such, he is considered to be an authority on modern design. As a final note here, owing to the unorthodox nature of earth-sheltered home designs, it’s been reported by many that financing from banks or credit unions can be hard to find. So, it may be the case that those interested in building such a home may have to save up the cash first or to do it themselves slowly over time or pay for most of it offering the financial institution a low loan-to-value ratio. Now that an overview of modern style earth-sheltered homes has been provided, I want to delve a bit deeper here into traditional styles — with a focus primarily on the “earth lodges” of the American Great Plains and Eastern Woodlands environs; the quiggly holes or pit houses of the Pacific Northwestern US and Canada; and the recessed homes of the Skara Brae settlement in what’s now Orkney (Scotland) which date back to 3180 BC (pre-Celtic invasion times). To start with so-called “earth lodges” — they are/were semi-subterranean buildings mostly or completely encased in soil/earth; much like modern earth-bermed buildings are. Found throughout the Great Plains and Eastern Woodlands until relatively recently these buildings could often be quite large — with some being up to 90 feet in diameter, or 60-feet across. The general design, though not a uniform one, is of a massive dome with a smoke-hole in the center. As one would expect, such buildings were much more commonly built by peoples that moved around less than by those living a more nomadic existence. Earth lodges are perhaps best known in connection with groups such as the Mandan, the Hidatsa, and the Arikara. Of course, there are variations of the idea that depend on location, climate, and culture. Typical construction was via the wattle and daub technique, with clay often being used in a cured state to provide thick insulation (often in conjunction with mounded earth). Construction typically began with the excavation of a recessed inner ground area; followed by the use of angled tree trunks (possibly with support posts) to create a dome, or hipped roofs; followed by a thick layer of reeds, grasses, and/or sticks woven through the trunks; followed by the installation of a thatched roof; followed by earth-berming. Typically, a fire pit would be located in the center of the earth lodge, under the smoke-hole — which would be covered during rough weather. Windbreak vestibules were generally used at the entrance ways of the buildings (inside and out). These buildings often also featured root-cellar type recesses dug down and lined with willow and dried vegetation for insulation. Notably, the Mississippian culture seems to have made use of earth lodges during its heyday. Moving on to quiggly holes (also known as quiggly/kekuli or pit-houses) — these were excavated homes often found in close proximity to each other, in so-called “quiggly towns,” throughout the Pacific Northwest region of Canada and the US. Typically situated in areas where solar exposure, food supplies, and freshwater were abundant, these settlements go back at least 7,000 years in the region. While such structures aren’t really used as homes anymore (though they were in historical times), similar buildings are still used to this day as sweat lodges. As log-frame longhouses and various other types of structures also have a long history of use in the Pacific Northwest, it’s not completely clear what the reasons for the variations of housing type were — whether cultural, environmental, or a mix thereof. It’s notable, of course, that quiggly holes are highly inconspicuous — and would perhaps serve as a very effective means of remaining “under the radar” so to speak. It’s also notable that such structures could perhaps be relatively effective fire or storm shelters, if need be. Moving onto the prehistoric settlement of Skara Brae in what’s now the Orkney archipelago of Scotland — this settlement was composed of 8 houses sunk and built into pre-existing midden (waste) mounds, and thus sheltered from the elements there. The settlement was apparently occupied from around 3180 BC to around 2500 BC, which means that the people living there were the Europeans of the age (meaning not immigrant Celtic or Germanic peoples, which only mass-migrated into Europe much later). The settlement itself was fairly small, probably home to no more than 59 or so people at a time — with the village appearing right around the same time that “grooved ware” pottery came into use/construction/style in the region. The houses themselves were pretty simple, being large square rooms with a stone hearth in the center, and one bed on each side. Each house was around 430 square feet in size (40 square meters). It’s not actually clear what was burnt in the hearths — with assumption originally being peat or dung, but the evidence now seeming to point towards seaweed. Interestingly, the larger of the two beds was located on the right-side of the room, as seen from the doorway — in keeping with Hebridean customs that persisted until the early 1900s that saw men sleep in a bed on the “right,” and women/wives on the “left.” This line of thinking seems to be supported by the presence of beads and painting pots under some of the smaller beds. It’s also notable here that one of the “houses” actually appears to have been a communal workshop of some kind — being home to small, divided workspaces, and to what seems to at one point have been a flue. This builder also features thicker walls, and a sort of protected entrance as well — which makes one wonder if it also served as a strong-house as well? Interestingly this building was seemingly not earth-sheltered at all, as well. A couple of other interesting things to note here about the Skara Brae site: the people living there appear to have been pastoralists with sheep and cattle that also grew barley; fish and shellfish were clearly commonly consumed; fish-bait was used and stored in waterproofed (with clay) stone boxes; there may well have been other buildings which have now been taken by the sea; some of the oldest rope in the world has been found at the site; artifacts made from whale teeth and walrus ivory have been found including knives, needles, shovels, adzes (tool similar to an axe with arched blade), beads, bowls, and awls. As a final note — almost all of the land that would have been ocean- or river-side during most of prehistory has now been covered by the sea and eroded away. Often many times over. The houses and structures that peoples would have been living in during these times are now gone as a result, leaving it something of a mystery what people were doing during these times. As evidenced by the somewhat recent news that the so-called “Neanderthals” seem to have definitely had seaworthy ships as long as 250,000 years ago, it’s quite clear that modern humans don’t actually know all that much about peoples living more than just a few thousand years ago. Some of these earlier peoples may well have been living in earth-sheltered houses though, even several hundred thousands of years ago.